Lost in a Good Book: Archie Andrews is all Grown Up! Archie Andrews is all Grown Up! A couple Christmas' ago, I got a great collection of Archie comics called The Married Life. It told two parallel stories of what happens to the town of Riverdale and all the gang if Archie married Betty vs. if Archie married Veronica. It was a really cool idea and for a Archie fan such as myself (I had stacks of these comics when I was younger!) it was very nostalgic. 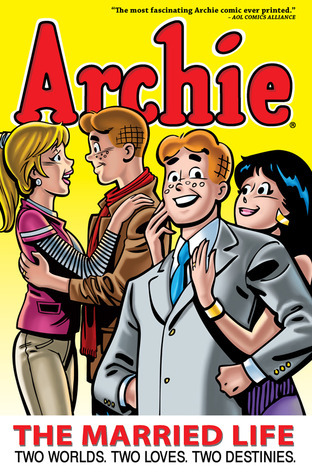 I recently found out that they have created more comics following the married life of Archie and his two best gals and I got the opportunity to read two volumes which goes into more detail about what happens to the two very different Andrews families from the time they get married. This critically acclaimed series (called by some the best comic writing in years) is fantastic and so much fun to read! Whose team will you be on? Team Veronica or Team Betty? I've personally always been a fan of Betty (her being a blond like me!) but I had someone recently lay this tidbit on me that has gotten me thinking: Betty is too good for Archie; Archie and Veronica deserve each other. What do you think? Whatever team you are rooting for, this is definitely a series to check out, especially if you want to revisit Riverdale!